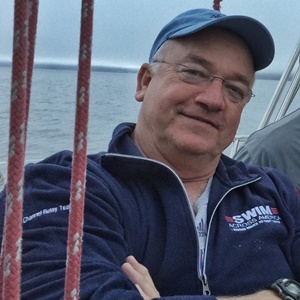 As one of the co-authors of the Rules of Marathon Swimming, Andrew believes in a unified swim community to support and observe incredible swims. Andrew currently lives in Seattle, WA and trains regularly at Alki Beach where he can be found most Saturday mornings. Wendy is well-known around town as the manager of Seattle’s most popular public pools, Medgar Evers and Colman. When she isn’t at the pool, she can be found swimming in her home waters of Vashon Island, either with the Dilworth Mermaids or on her own in Quartermaster Harbor. Melissa is a member of the South End Rowing Club in San Francisco, and a former board member of Citizens for a Healthy Bay in Tacoma. She lives in Tacoma, WA and trains regularly along the Tacoma waterfront at Ruston Way and Point Defiance. Melissa began marathon swimming just a few years ago, but has already completed the marathon swimming Triple Crown. She currently lives in Redmond, WA, swims regularly at Alki Beach on Saturday mornings, and coaches for VO2 Multisport. Her other passions include getting veterans and new marathon swimmers into the water, and adventuring to alpine lakes. Once upon a time, Scott swam for the University of Washington. Since then, he has met just about every swimmer in the Northwest. He's very popular. Aside from an impressive open water resume, including completion of the Triple Crown, he is actively involved in running several local open water swim events for his USMS team and Shadow Seals, and has mentored many young marathon swimmers in the area. Scott lives in Seattle, WA, and holds the USMS National Records for the Men’s 50-54 and 60-64 SCY 200 butterfly. Thank you for your service. Where are they now? Jerome Leslie, Treasurer from 2015 to 2017, maintains his involvement with NOWSA as the Official Towel Boy (shown here in the Seattle Times holding a towel).